Women want good sized, round and firm breasts to enhance their beauty. But some women have oversize breasts and it looks ugly on their body, some health factors also could be generate like rashes under the breasts, back pain, neck pain, tenderness, arthritis and shortness of breath High estrogen level is main cause of over shaped breasts size and some other factors also include such as genetics, obesity, breastfeeding, pregnancy, use of certain drugs and hormonal changes in the body. Extremely large breasts affect your beauty, attractiveness, confidence and your posture. Women with large breasts have a difficulty to do exercise and well-fitting clothes. Don’t be upset anymore for your large breasts. Today I am sharing you the some exercises and life styles which help to decreasing your breasts size. Also I will share you the best home remedies to reduce your breasts size naturally. You must try these reducing exercise and remedies and see the desired results. Women who have extremely large breasts can’t be running and jogging easily. These women must be select easy exercises to do such as Pushups and dumbbell bench press. 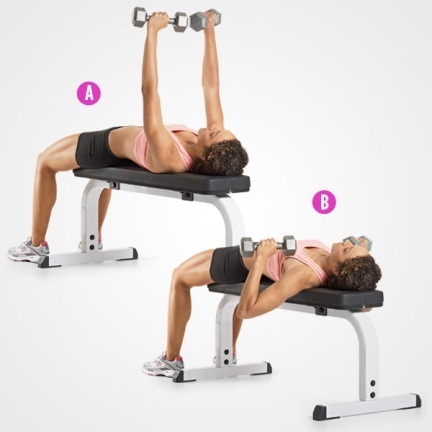 Lay on a bench and straight your arms with a dumbbell in your both hands. (See Picture A). Lower the dumbbells besides of your chest (See Picture B). Then pull them again straight position, its 1 rep completed. Now wait only 10 seconds and repeat 2 or 3 sets again. Continue this exercise for 3 months. Wear fitting clothes during exercise. Straight your body from head to knee, and close your feet together (See Picture A). Now lower down until your chest touch the floor. Your arm must be in 45 degree angle position (See Picture B). Pause for 1 second, then push back to start position. Do 10 pushups, and then wait for 2 minutes. Continue this exercise for 3 months, and wear fitting clothes. Climb the stairs in straight position and then walk down. Do this exercise for 15 minutes with taking rest. Bicycling is another exercise which help to decrease breast size, ride it for 15 minutes. Make your routine at least 4 times in a week. Burning the pomegranate peel into the sesame oil properly. Massage your breast from this burning oil, Do this 3 times in a day. After use of this remedy, you will feel good result. Put water in a plastic cup and freeze it into the refrigerator. Now, sit in hot water tub or you can take hot water bath, massage your breast form this cup shape of ice for less than a minute. If you can’t breasts massage from ice, then you sprinkle normal cold water on your breast. Now, mix 1 tsp of black pepper oil and 1 tsp of jojoba oil in a plate. After ice massage or sprinkle water, massage your breast from this oil mixture. Continue this remedy for 1 – 2 months. Your breast size will be decrease. Take a piece of alum and dip into the milk and shake it for 2 minutes. Now apply this milk on your breast wait for few minutes. Do this for 15 days. Simply put the 250 gram sesame oil in a pan, add 50 gram pomegranate peel in it, now heat it up until pomegranate peel burned. Does alum and milk method works effectively?? Does alum and milk method works effectively???? a normal piece of alum is required to shake in the milk for 2 or 3 minutes. you don't need to dissolve, you just take normal piece of alum and shake it in the milk for 2 or 3 minutes, then apply the milk on your breast, yes you can use twice it too. How many days use this pomegranate peel oil for good result?? the result will show after 2 months. Raw milk or boiled milk use this remedy??? use any raw or boiled, both are good with alum. Alum milk remedy use only 15 days or more??? Thank u i well try it. Please the alum method will I see the results right after the 15days? Sister you need to do also some exercises to get result.